Continental Rummy is a Rummy variant that supports a lot of people. A lot of people. You can play it with as few as two or as many as twelve players! Unlike many other rummy games, in Continental Rummy you cannot lay down melds as you get them. Also, unlike Gin Rummy, you cannot go out with part of your hand unmelded. Going out is an all-at-once, one-and-done deal. The object of Continental Rummy is to be the first player to organize your hand into sequences and go out. The size of the deck in Continental Rummy scales up as the number of players do. A game can use as few as 106 or as many as 212 cards! 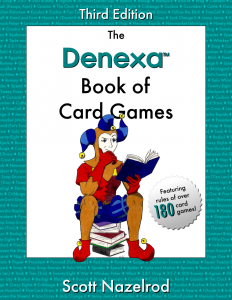 If playing with two to five players, shuffle together two decks of Denexa 100% Plastic Playing Cards plus two jokers. For six to eight players, use three decks plus three jokers. And for nine or more players, use four decks plus four jokers. You will need some way of keeping score. The simplest way is to give each player an equal number of poker chips or similar tokens and handle the accounting that way. Each of these chips may represent a cash value, if desired, or simply an abstract point. 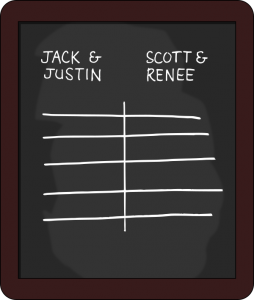 You can also use pencil and paper, but scoring on paper is complicated by having to enter each score twice (as a plus for the winner and as a minus for each loser). Shuffle the cards, using the multiple-deck shuffling technique if needed. Deal fifteen cards, three at a time, to each player. Then, place the stub in the center of the table, forming the stock. Turn the top card of the stock face up. This card, the upcard, is the first card of the discard pile. The player to the dealer’s left goes first. They begin their turn by drawing either the upcard or the top card of the stock. Then, they discard any card they wish, which becomes the new upcard. Play then passes to the left. Play continues like this until a player can go out. If the stock runs out before then, set aside the current upcard, shuffle the discard pile, and turn it face-down to form a new stock. Players are attempting to use the cards they draw to build sequences. A sequence is three to five cards of the same suit in consecutive order. Cards rank in the usual order, and aces may be high or low, but not at the same time. That is, 3-2-A-K-Q is not a valid sequence. Jokers count as wild cards, and may substitute for any card a player wishes. A player may have multiple sequences of the same suit. Unlike most other rummy games, sequences are the only melds in the game; sets of three or more of a kind do not count as a meld. Three four-card sequences and one three-card sequence. One five-card sequence, one four-card sequence, and two three-card sequences. No other combination of sequences (e.g. three five-card sequences, a twelve-card and a three-card sequence, etc.) is allowed. When a player is able to go out, they discard their sixteenth card and lay the others face up on the table. The players then verify that it meets one of the legal patterns listed above. If it does, the player wins the hand. If it doesn’t, the hand continues, with the player who wrongly declared themselves out being forced to play with an exposed hand. Game play continues until one player reaches a previously agreed-upon number of points. That player, of course, wins the game. California Jack is a trick-taking game for two players. It plays pretty similarly to All Fours, which it descends from. Unlike most games, though, the stock is kept face up. This allows each player to see what’s coming up on future draws, and lets them keep track of what’s in their opponent’s hand! The object of California Jack is to be the first player to reach a score of ten points. Players score points by capturing certain trumps and the most card points overall on a hand. California Jack uses a standard 52-card pack of playing cards. 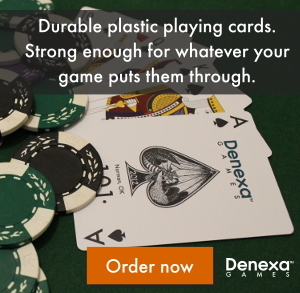 The choice is yours as to what kind to use, but we of course endorse playing with Denexa 100% Plastic Playing Cards. Shuffle and deal six cards to each player. Then, place the stub face up in the center of the table, forming the stock. The suit of the top card of the stock becomes the trump suit for the hand. The non-dealer leads to the first trick. They may lead any card they wish. The dealer must either follow suit or trump. Only if they have neither a card of the suit led or the trump suit are they free to play a card of any other suit. The highest card of the suit led wins the trick, unless someone played a trump to it, in which case the highest trump takes the trick. The winner of the trick puts the two cards in a won-tricks pile in front of them, then draws the top card of the stock. The player who didn’t win the trick then draws the next card. The winner of each trick leads to the next one. Players should keep an eye on what the next card of the stock is going to be. Many times, whether a player wants this card or not will determine how seriously they contest the trick. Additionally, as the hand goes on, a player with a good memory can keep track of the exact contents of their opponent’s hand. After the stock is exhausted, the players simply play out the last six tricks without drawing. Game—accruing the highest total of cards captured during the hand, scoring as follows: ten for each 10, four for each ace, three for each king, two for each queen, and one for each jack. 9s and below do not count toward the game score. If two players tie for game, the point is not scored. After scoring the hands, the non-dealer from the hand just played deals new hands. Game play continues until one player reaches ten points. When a player scores their tenth point, scoring stops immediately. That player wins; the remaining points for that hand do not count. Yaniv, as it is known in Israel, or Jhyap or Dhumbal, as it is known in Nepal, is a rummy-type card game for two to five players. Yaniv shares a common goal with Gin Rummy: each player is trying to reduce their unmatched cards’ point total below a certain threshold, whereupon they can end the game. In Yaniv, however, melds are discarded instead of held in the hand, meaning certain cards can be drawn from the discard pile and used over and over. The game most likely originated in Nepal as Jhyap. Somehow, it spread from there to Israel, where it has enjoyed a period of popularity, especially among younger players, for the past several years. The object of Yaniv is to discard melds and be the first to call “Yaniv”, hopefully ensuring that the total of your unmatched cards is lower than that of your opponent. Yaniv is played with a 54-card deck formed by augmenting a deck of Denexa 100% Plastic Playing Cards with two jokers. If you are playing with four or more players, you may wish to use a 108-card double deck to avoid frequent shuffling. You’ll also need something to keep score with—pencil and paper will do the job wonderfully. Shuffle and deal five cards to each player. Place the stub in the center of the table to form the stock. Turn over the top card of the stock; this is the first card in the discard pile. In Yaniv, each of the face cards is worth ten points. Aces are worth one point, and are always low. All other cards are worth their face value. Jokers are worth zero. The player to the left of the dealer goes first. Unlike most rummy games, in Yaniv, the first thing a player does is discard. A player may discard a single card, like they do in typical rummy games. However, they may also discard a set of two or more cards of the same rank. They can also discard a run of three or more cards of the same suit in sequence (e.g. 8-9-10-J♦). A player may only make one discard per turn. They can’t discard, say, a set then a run, or two runs, or two different sets. In sequences, cards rank in their usual order, with aces always low. Q-K-A is not a valid combination! Also, jokers may be used as wilds to substitute for any card in a sequence (but not in a set). It is important to keep the cards discarded in the proper order. Runs must always be kept in numerical order. Sets may be played in any order the player chooses. After discarding, the player draws. The player may draw one card from the stock, or they may choose to take either the first or the last card that the previous player discarded. Thus, if the previous player discarded 8-9-10-J♦, the player may only draw the 8 or the jack, not the 9 or 10. This is where some strategy in discarding can be used—by carefully choosing the order they discard the cards in, a player can deny access to certain cards to the player after them! As the game goes on, players gradually reduce the count of their deadwood (the cards left in their hand). When a player’s deadwood reaches five or fewer points, they may call “Yaniv!” to go out. This must happen at the beginning of their turn, before they discard. All players then turn their cards face up. If the player has the lowest point total, they score zero for the hand, and all other players score the total value of the cards left in their hand. If another player has a lower point total than the player that called “Yaniv”, every player scores the value of the cards left in their hand. The player that called “Yaniv” also scores a 30-point penalty. At the end of a hand, if a player has a score of exactly 200 points, their score resets to 100 points. Likewise, if a player ends a hand with exactly 100 points, their score is reduced to 50 points. The deal passes to the left and another hand is dealt. This continues for as many hands as necessary. When a player’s score exceeds 200 points, they are out of the game and are not dealt into later hands. The last player remaining in the game is the winner. In any card game, mistakes sometimes happen in dealing or the course of play. Cards get dropped, decks sometimes have the wrong number of cards, and hands sometimes get discarded by accident. All mistakes like this are, as a general group, called irregularities. As the host, it’s your job to decide how to handle any irregularities that occur in your game. It’s important, especially in games like poker with money involved, to know how to handle them in a fair and consistent way. Ruling one way in one situation and a different way when it happens again engenders distrust from your players. That means some of them may not come back the next time you host a game. If you stick to the same rules, your players will play confident in the knowledge that they will be treated fairly in such a situation. The resolutions recommended here are based on Bob Ciaffone’s “Robert’s Rules of Poker”, the governing document of modern poker. If your players have played in a casino poker game, they’ll appreciate having the situation resolved the same way it would be in the casino. Even if you’re not playing poker, these general rules will be helpful in a wide range of situations. Any time that irregularities cause a hand to be abandoned and re-dealt, it is called a misdeal. When a misdeal occurs, the dealer gathers up the entire deck, including the players’ hands. The same dealer then shuffles and deals a new hand. In most cases, a misdeal can only be declared at the beginning of a hand. After two players have acted on their hands, the opportunity to declare a misdeal ends. Regardless of what may have happened on the deal, the hand is played as usual from that point. Dealing the first card to the wrong position. Not dealing a hand to a player who is in the game. Dealing a hand to someone who isn’t in the game (or an empty seat). Dealing cards in the wrong order. Giving a player too many or too few cards, unless the players missing cards would simply get the next card(s) of the deck if the proper sequence were followed. If the dealer accidentally exposes the first or second card of the deal, this causes a misdeal. Should the dealer expose a card after this, and the game is one where the entire deck is not dealt out, the dealer completes the deal as usual, then replaces the exposed card with the top card of the stub. The exposed card is then placed in the discard pile, or as the bottom card of the stub, if the game doesn’t use a discard pile. (If the game starts each hand with one card in the discard pile, the exposed card will count as that card. In Texas Hold’em and Omaha, the exposed card is usually placed on top of the deck and is used as the first burn card.) In games that deal out the whole deck, or if the dealer exposes a second card, it causes a misdeal. Players never have the option to accept an exposed card. Doing so is unfair to the players that did not have their cards exposed. It also encourages collusion between the dealer and the player. If a player flashes one of their own cards after the deal is completed, they do not get a replacement. The card is still live. The player assumes all consequences of the other players’ knowledge of their card. If a player intentionally shows cards to another active player, these cards must be shown to the entire table. This is to prevent that player from having an advantage. If the player shows cards to a player who is not currently in the game or to someone who isn’t playing, those cards must be shown to the other players at the end of the hand (or identified when they would be shown otherwise). A card that is turned opposite to the rest of the deck (i.e. it is face up when the rest of the deck is face down) is called a boxed card. If only one boxed card is found, it should simply be set aside. Boxed cards that get mistakenly dealt in error should be replaced at the end of the deal as if it were an exposed card. If the game requires that the entire deck be dealt, or a second boxed card is found, it causes a misdeal. We’ve discussed these before in “Incorrect and imperfect decks“, but here’s a refresher. Decks with damaged cards or cards identifiable from the back are called imperfect decks. Decks that have the wrong cards for the game being played are called incorrect decks. Every player has an obligation to point out that the deck has something wrong with it if it comes to their attention. After the hand ends, the deck should be corrected, if possible. If not, a new deck should be substituted. Imperfect decks should always be replaced at the end of the hand. If a card with a contrasting back design is discovered in the deck, the hand is void. The only exception is if the foreign card is found in the stub after dealing is complete, and is not part of the stock or any other place where it could potentially be put in play. If a too many copies of a card (i.e. with the same rank and suit) are found in the deck, the deal is void. The scores are reset to what they were at the beginning of the hand, or any money placed in the pot is refunded. In most cases, the deck having too few cards is not cause for concern. The deal is simply finished out as usual. However, if the game requires all cards to be present (because they are all dealt out initially or because every card is used at some point), when the number of cards is discovered to be inadequate, the hand is void, as if it had a foreign card or too many cards. If a player discovers a joker or other card that simply doesn’t belong in the deck (like, say, a 2 in Pinochle), it is treated the same as if it were a boxed card. That is, the player should call attention to it and set it aside. The dealer should give the player a replacement card after the other cards have been dealt. If the dealer accidentally slides a card off the table, it should be treated the same as an exposed card. If a player drops their own card on the floor, the card is still live. In either case, the card should be recovered as quickly as possible. Any dropped cards should be inspected for damage prior to being returned to play. It’s easy for cards on the floor to get stepped on and bent! Zetema plays like a weird mashup of Bezique and a rummy game. It can be played by two to six players. If four or six play, they play in two or three partnerships, respectively. Zetema was most likely created by Walter Pelham, an employee of British card maker Joseph Hunt & Sons. Hunt & Sons published and marketed the game in the 1870s. Its rules were sold in a pack with (unnecessary) special cards and markers similar to those used to play Bezique. The rules were also published in a few card game books of the period, but it never really seemed to catch on, fading into obscurity shortly thereafter. Zetema seems to have fascinated several card game experts, who appear to take its failure to achieve popularity as a bit of an affront. It was one of the many games that Sid Sackson plucked from obscurity in A Gamut of Games. Sackson overhauled the game, changing its rules and scoring with the aim of balancing it. David Parlett later took Sackson’s version of the rules and cleaned up its terminology before publishing it in several of his books, including The Penguin Book of Card Games. The rules we present here are those according to Parlett. The object of Zetema is to be the first player to reach a score of 300 points (200 when four or more play). 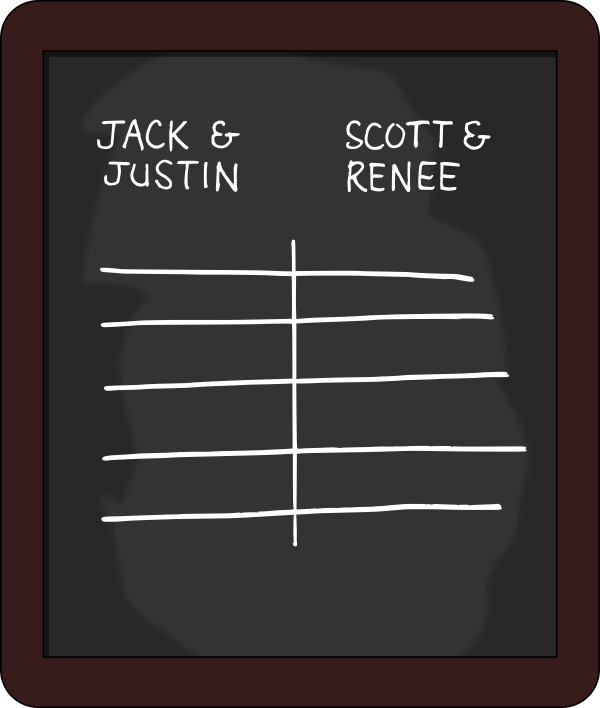 Points are scored by forming and declaring melds and zetemas. Zetema is played with a unique 65-card deck. Take one deck of Denexa 100% Plastic Playing Cards and add a complete thirteen-card suit from another deck with the same back design. Which suit is chosen doesn’t matter, but it should be communicated to all players. You will also need something to keep score with. Pencil and paper, a dry-erase board, a smartphone application, or semaphore flags are all acceptable options. If playing with four or six, determine the partnerships, either by some random method or by mutual agreement. Partners should be seated across from each other, so that as the turn goes around the table clockwise, it alternates partnerships (A, B, A, B in the four-player game, or A, B, C, A, B, C in the six-player game). Partners’ scores are added together, but otherwise the game functions as in the non-partnership game. Shuffle and deal six cards to each player, or five in the six-player game. Place the remainder of the pack in the center of the table, forming the stock. The player to the left of the dealer goes first. They draw one card from the stock. If they have any melds, they may show them (but do not lay them down on the table, as in most rummy games). Upon doing so, they immediately score for the meld. They then end their turn by discarding one card; if they declared a meld on that turn, the discard must be one of the cards of that meld. After a player’s turn, the next player to the left may play, and so on. Below are the possible melds in Zetema. Note that some of them refer to six cards; in the six-player game, these melds consist of five cards instead, as that is the maximum hand size when playing with six. Sequence—Six cards of consecutive rank, not of the same suit. Scores 20. Flush—Six cards of the same suit, not in sequence. Scores 30. Flush sequence—Both a flush and a sequence, i.e. six cards of the same suit of consecutive rank. Scores 50. Assembly—Five cards of the same rank. Scores differently according to the rank of the cards involved: kings or queens 130, jacks 120, aces or 5s 110, all other ranks 100. Instead of a declaring a meld, a player can declare a marriage. A marriage is a king and queen of the same suit. A player can simply have both cards in their hand, usual. But if a player holds just one card of the marriage, and the other is in the discard pile of the appropriate rank, they can pull it out of the discards to score the marriage. Multiple marriages may be scored at once, and in fact, they score more when declared in bulk. A single marriage scores 10 points, a double marriage 30 points, a triple 60, and a quadruple 100. A marriage in the duplicated suit is called an imperial marriage, and an extra 10 points is scored for each of these declared. If all five marriages are declared at once, the player scores 150 points! When one or more marriages is declared, a player discards all of the relevant cards to the general wastepile, not the king and queen piles. Once placed here, they cannot be removed. The player then draws back up to six cards (five in the six-player game) and their turn ends. They do not make a discard to the per-rank piles. A player holding a meld (such as a flush or sequence) involving a king and queen cannot declare the meld and sequence on the same turn. Instead, the meld must be declared first, and the marriage declared on a subsequent turn. When a player discards the fifth card of one rank to that rank’s discard pile, they have formed a zetema. That player then scores according to the rank of the zetema. A zetema of jacks scores 20 points, of aces or 5s scores 15 points, and of any other rank 5 points. Zetemas of kings or queens theoretically score 50 points each, but these are rarely scored, since they cannot be scored if even one marriage is formed. After scoring a zetema, the player forming it moves all five cards in the general discard pile. Game play continues as above until the stock is depleted, at which point players simply stop drawing. At this point, if a player runs out of cards, they drop out of the hand. The hand ends when the entire deck is in the general discard pile. Another hand is then dealt, and game play continues until someone reaches the target score of 300 points (200 if four or more play). When this happens, the rest of the hand is not played—the game ends immediately. Whoever reached the target score is the winner.